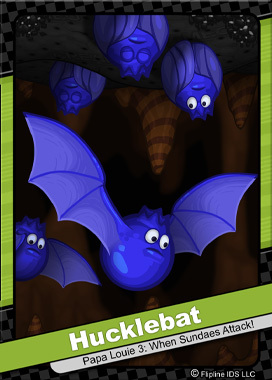 Hucklebats live deep within the Cookie Caverns. They spend most of the day sleeping upside down from the crisp cookie ceilings of the caves. Unfortunately, Hucklebats are very light sleepers and will be awaken by the slightest sound. This will cause them to swoop down towards the source of the noise to evaluate the potential threat. When spelunking, one should alway look up to see if any Hucklebats are looming over your path.